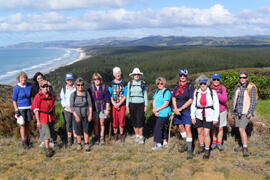 Te Arai Point is a beautiful isolated spot just south of Mangawhai. A sweep of beach ends eventually at Pakiri and Goat island. Drive via Coal Hill Road or Te Arai Point Road. Park at Te Arai Point north side car park. Climb the hill on the right. Follow the tractor track to an intersection of mown tracks. Keep looking behind to enjoy the view to the north! At the intersection of tracks take the grass track on the sharp right and follow it inland up the hill to the trig. Continue on the open track turning left at the next intersection. Keep walking on this open section until a gate appears on the left. Keep your eyes open on your right hand side before you approach the gate, take a 10 metre detour to the nearest high point to spot the dune lake with its stunning backdrop of tree ferns. 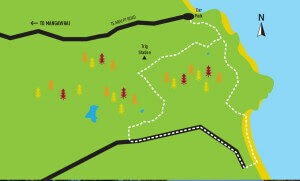 Walk through gate and follow the short forest track through the pine trees to the road to exit the Regional Park. Turn left to walk down the side of the road to the Forestry Beach car park where basic toilet facilities are also located. At the carpark, follow the track marked by a barrier arm to the beach. Turn left and almost to the north end of the beach to find the memorial seat, amid the tussock. Nearby a walk arrow gives directions to return up the hill on a very narrow track (follow the right hand arrow), and through a bush patch. On emerging from the bush, turn left onto a mown tractor width track and continue up the (very steep, for about 50m) hill. Before turning left you can take a short 20m detour down to a viewing area to see a stunning view south of Forestry Beach through towards Pakiri.